Welcome to the 2014 edition of 24 Days of Turtle. 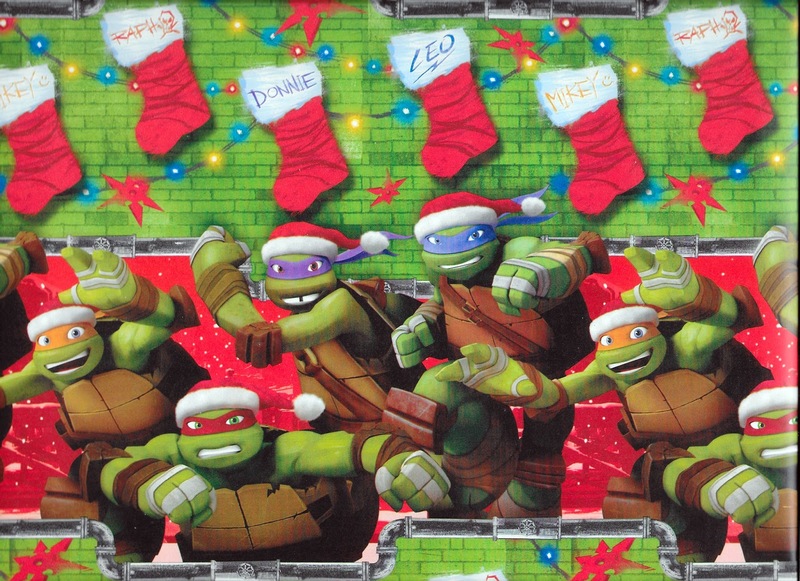 The awesome advent calendar features daily TMNT Christmas-themed treasures. There will be festive fun, gracious gifts, and Turtle Powered prizes! Unwrap DAY 9 of the countdown. 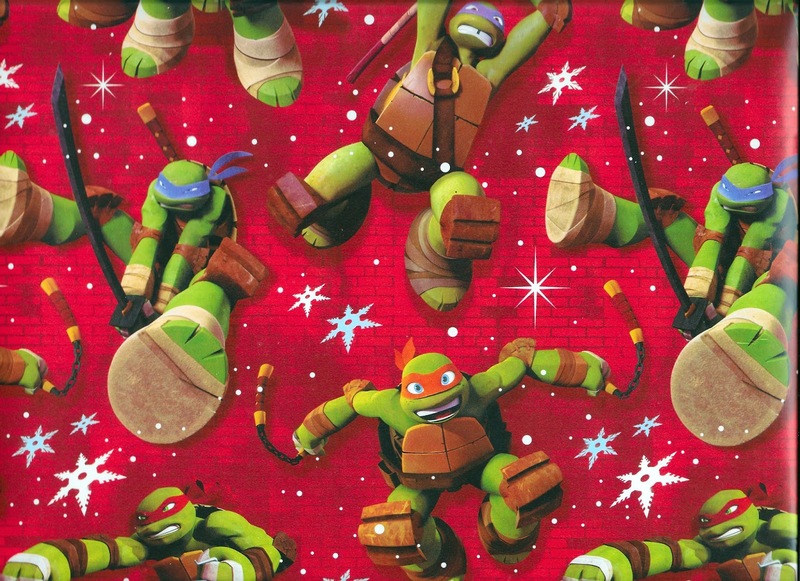 Last December, I stumbled upon a roll of TMNT wrapping paper. It marked the return of a product that played such a crucial part of my youth. I fondly remember tearing through it at birthday celebrations and Christmas holidays throughout the late 80s and early 90s. A true staple of my childhood. Seeing a similar product hit stores shelves again last year was a benchmark moment. It symbolized not only a TMNT return, but indicated their popularity was on the rise. 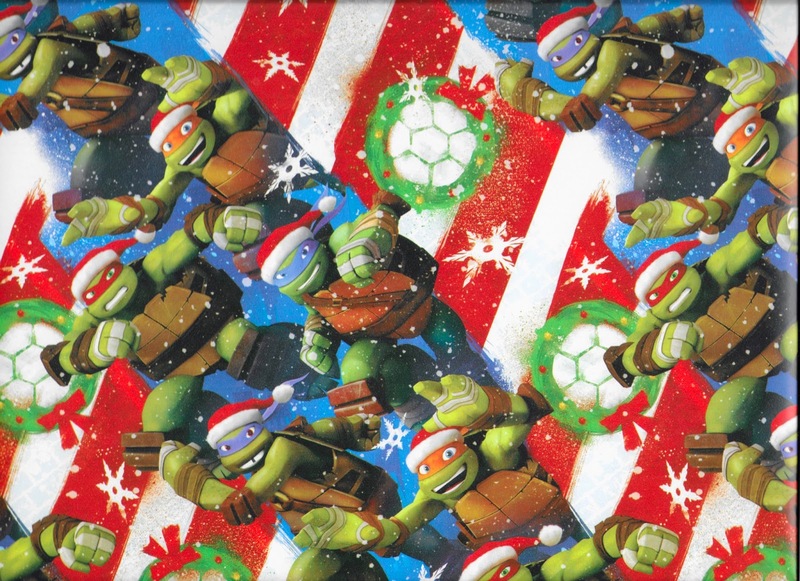 I searched for other TMNT wrapping paper - eager to see more holiday-themed designs. No luck. That one roll was all I found. But, this year? I landed an entire wrapping paper bundle! If one roll of paper marked TMNT's popularity last December, finding a bundle symbolizes the ever-growing popularity of this franchise. My choices of Christmas wrap quadrupled in only one season. 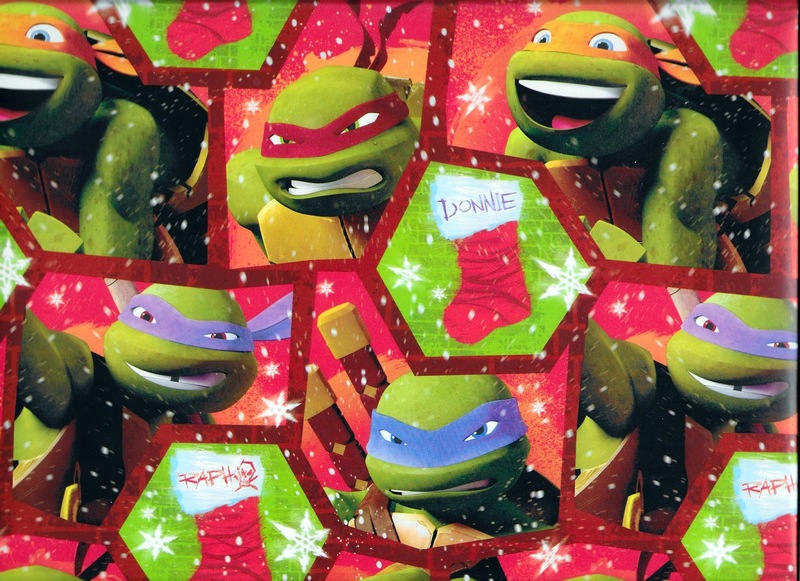 I was Grinch-like with my TMNT paper supply last year. Since I had purchased just one roll, only a select few received gifts were covered in the elusive wrap. This December will be different! With 4 designs to pick from, everyone can expect their gifts to be cloaked in Turtle Power. The designs range from serious to silly. Ninja poses on one roll, Turtles in Santa hats on another. The bundle package also includes 7 decorative bows and 10 gift tags. I paid less than 10 bucks for this thing and feel like it will last me a decade. Each day of 24 Days of Turtle will feature a Turtle-Powered present. Today's gift is a scan from each roll of wrap included in the bundle. Set these merry mutants as your computer, tablet, or mobile device wallpaper. There are 4 festive designs to choose from. I'm also including a scan of the gift tags too. Go Christmas crazy and put them over all your gifts. Check back tomorrow for DAY 10 of 24 Days of Turtle for more festive fun, gracious gifts, and possible prizes! Until then, stay jolly, dudes & dudettes! I'm loving the countdown, but you're going to cost me an arm and a leg in printer carts with all the gifts you've been giving us, but keep up the great work, it's been a blast. Hah! That's an excellent point. Maybe I should create a digital tree to hang all these things on? It would be hard to wrap gifts with such fine looking paper, knowing it was going to be torn to shreds later. Where oh where did you find that? A Wal-Mart in NJ while visiting family over Thanksgiving weekend. Awesome, thanks! I hope they have it in my area too. For decoration you need curling ribbons, embellishments, decorative items, confetti, misuhiki cords or glitters.